DuraChew Dental Dino Dog Toy. I’m sure that you dogs have had a Nylabone or two in your life. They’ve been in business since 1955, so your humans must know how great they are for us. Let me tell you about this Dino. It’s actually a Brontosaurus AND a dental chew! How cool is that? Good news for this dinosaur, he is not the edible type of chew. That means that I cannot make him extinct. There are little nubs all over to help fight tartar buildup and clean my teeth. My Bronto is wonderful, but Mom still watches me when I’m chewing on it. I’ve put a lot of chewing into it and so far, it is holding up great. The shape is perfect for chewing. I can hold it between my paws or carry it to hide from Pierre. He has been trying to steal it ever since it arrived. 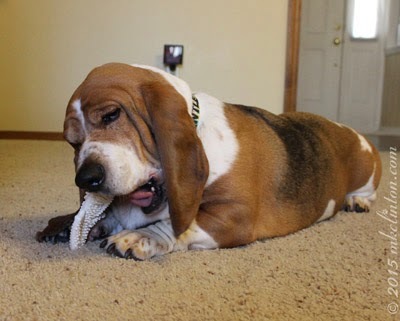 I asked Mom if she would just click on Chewy.com and order Pierre his own Nylabone DuraChew Dental Chew Dino Dog Toy. They are only $3.99 and he might get the Stegosaurus or a T-Rex shape. I don’t usually mind sharing, but I do some serious gnawing on mine. It’d be best if he had his own, you know with the slobber and all. Once I’ve had my fun, Mom just washes it with warm soapy water and rinses it thoroughly. I’m proud to say this toy was made in the USA from nylon and it tastes like chicken! 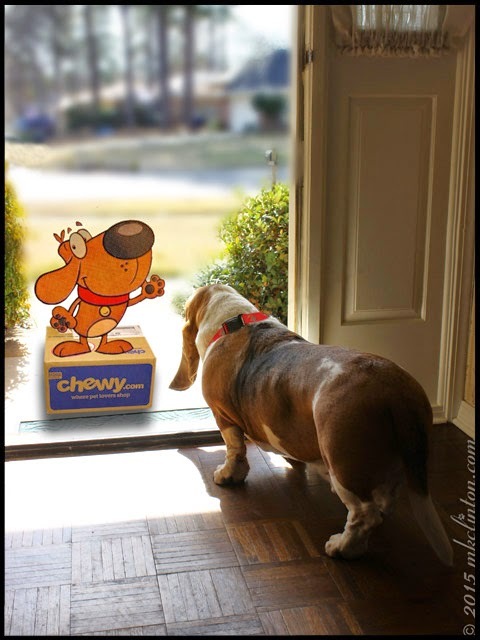 *Disclaimer: Barking from the Bayou received one Nylabone Dental Chew from Chewy.com in exchange for our honest review. There was no monetary compensation. I only share information about things that we like and believe that you will benefit from as well. Nylabone or Chewy.com are not responsible for the content of this post. Today is the 80th Pet Parade Blog Hop! We have grown from just a few blogs parading with us to a Mardi Gras sized parade each week! 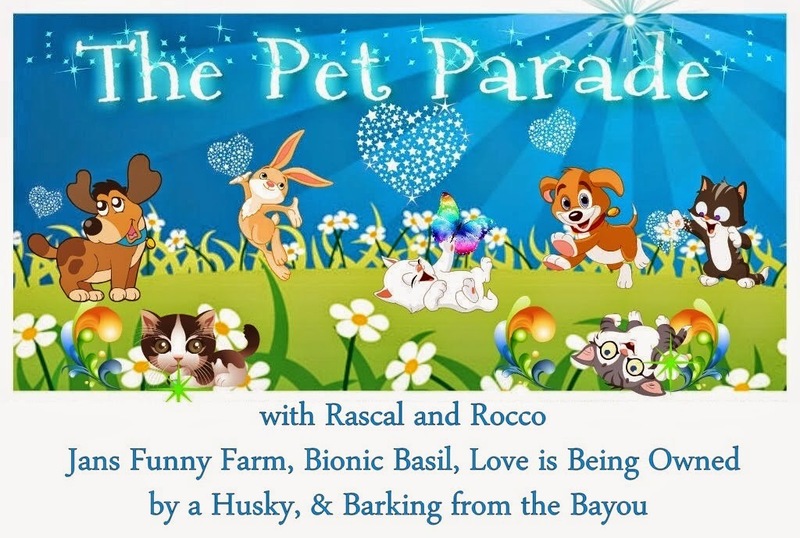 Join the fun with Rascal and Rocco, Bionic Basil’s Blog, Jan’s Funny Farm, Love is being owned by a Husky, and me to celebrate. A special thanks to Bionic Basil for our awesome new badge! 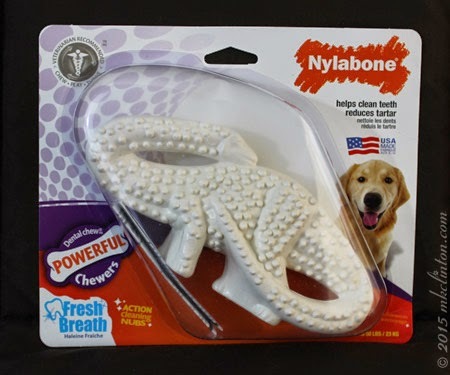 We love Nylabones but haven't seen the Dino bone - this looks great! I love the textured surface and I like that it's all over the Dino. Much better than the smooth ones. Definitely going to try this one! Thanks for the reco. Looks like ya got some good chewin in! My sister's four dogs just LOVE those dinosaurs!! That is the only thing she allows them to have! We kind of like having a "variety" !! Those sure look good though!! WE LOVE NYLABONES!!!! And have never seen Dino here!! Cool!! Wow that looks great. Have a fabulous Friday. Glad it works for you. Mom tried them years ago with her dog Trine who broke them into tiny pieces and tried to eat them in about a minute. Katie did the same, so we aren't allowed to have them around. I guess we are violent chewers or something, but if we get one, it is in pieces in short order and Mom doesn't feel it is safe for us to eat them. Bentley, you sure are enjoying your dino bone. WE have one of those and we got OURS from Chewy.Com, also... We like IT and CHEWY a LOT. I think I need such a bone too... it makes me as big and mighty like a dino , right? look at you doing to town on that Dino, good for you and your teeth. Your not spoiled one bit. Looks like Bentley is enjoying that. Bentley, you are one lucky doggie!! Bentley looks as if he's throughly enjoying his dental care routine ;-) Just watch out for potential tooth damage ~ I'm paranoid about that now after Buzz's fracture. 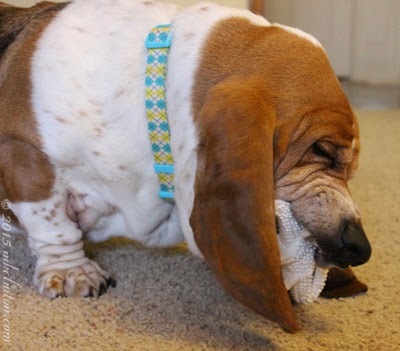 That's an awesome chew toy! We can see why you wouldn't want to share that, Bentley! Things like that are so tough around here, because Sheba and Luke destroy just about everything they chew on! It's a constant struggle finding things like this that are safe for them.